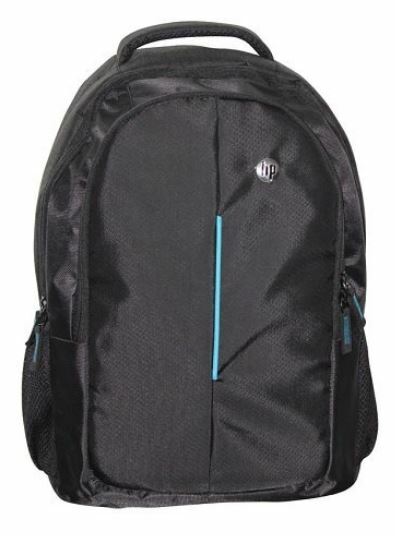 Presenting the all new HP Runner 15 inch laptop backpack (Black). The all time solution to laptop portability solution for all laptop owners on the go, under budget. How many times have we cribbed over carrying our heavy laptops in our hands the whole day and come back with sour arms? Say goodbye to that problem with the HP Runner backpack. This sleek, black bag is designed to attend to your laptop portability woes. It has 2 compartments in it so that other than just storing your laptop, you can easily carry a few snacks, the laptop charger cable, a bottle of water or perhaps even a good book to read as well. The bag can easily support the dimensions and weight of a standard 15.6 inch laptop without any glitches. It is made from strong materials and is designed for rugged use. Coming from the house of HP, this bag is specially designed for HP notebooks only, but however, it can fit any laptop you own. With a perfect combination of style and durability, you just can't go wrong with this bag. The classy and affordable bag is very comfortable to carry and is highly durable for all college goers. The magnificent padding in the bag is designed very efficiently to take up as little space as possible, while providing as much protection as possible. The shoulder straps are also heavily padded to feel extremely comfortable even when the bag is fully loaded. With a huge spacing compartment, a perfect laptop sleeve, comfortable padding, stylish looks and the HP brand name, the HP Runner 15 inch laptop backpack is just the thing you need. Buying this bag does not only mean a perfect fit for carrying your laptop, it also means a stylish accessory for your daily lifestyle. Though not completely water proof, it will protect your laptop and other contents in the bag against mild rain showers and your friends messing around with water bottles. Even when you are not storing your laptop in the bag, you could still easily use it as a regular backpack, thanks to its versatility and sleek black looks and amazing utility. The bag alone weighs just 350 grams and so it's extremely light. The HP Runner backpack comes with a 1 year warrantee against all manufacturing defects. However, physical damage such as wear and tear etc. are not covered under the warranty. 1. It has 2 compartments in it so that other than just storing your laptop, you can easily carry a few snacks, the laptop charger cable, a bottle of water or perhaps even a good book to read as well. 2. It is made from strong materials and is designed for rugged use. 3. The magnificent padding in the bag is designed very efficiently to take up as little space as possible, while providing as much protection as possible. The shoulder straps are also heavily padded to feel extremely comfortable even when the bag is fully loaded.